IHOP's popular "All You Can Eat" pancakes is back for a limited time to kick off 2016. Under the promotion, you can order either a stack of five buttermilk pancakes or a short stack of two buttermilk pancakes with a combo plate of eggs, hash browns, and a choice of breakfast meats and once you finished your pancakes, you can request additional short stacks of two pancakes again and again until you've had enough. For an additional cost, you can add a fruit topping to your unlimited pancakes including strawberries, blueberries, cinnamon apples, and peaches. 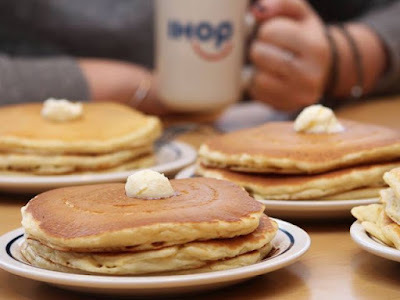 "All You Can Eat" pancakes, like breakfast, is available all day at IHOP through February 14, 2016. The price and participating may vary.